Converse Bank is the general sponsor of the 12th Annual Yerevan International Music Festival that started on September 10. This year the festival is dedicated to the 2800th anniversary of Yerevan. 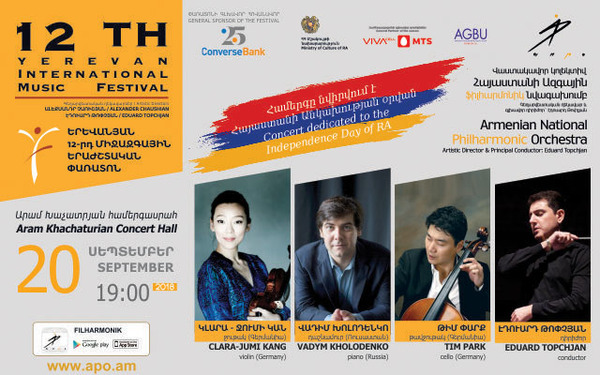 Supporting the International Music Festival, Converse Bank makes another contribution to the development and promotion of the cultural sector. "This is the most important event within the framework of Converse Bank’s 25th anniversary events. We are convinced that culture and art are the very important sectors that educate and mold generations, shape individuals. In this regard, we are confident that the format of society-business cooperation in terms of popularizing culture and art is one of the most effective formats, and with this understanding we have been participating in different projects promoting culture and art for above two decades", - said Artur Hakobyan, Chief Executive Officer of Converse Bank. The most distinguished cultural initiatives of Converse Bank include Montserrat Caballé’s visit to Armenia and Artsakh, performance of Astor Piazzolla’s famous tango opera "Maria de Buenos Aires", and Yerevan concerts by Barboza trio. It should be mentioned that the program of the annual festival will be composed of 7 symphonic and 2 chamber concerts, 1 opera performance, and 2 solo concerts. Among many works, the Armenian National Philharmonic Orchestra will also perform world premieres. Classical music evenings will be held. The festival will close on October 25, with performance of G. Puccini’s opera "Madama Butterfly", which will take place at the National Academic Theater of Opera and Ballet after Al. Spendiaryan. All concerts of the festival will be headed by Eduard Topchyan, artistic director and principal conductor of the Armenian National Philharmonic Orchestra.